Biologist Brandon Ballengee has spent most of his professional career examining amphibians to understand their development in complex ecosystems and proximate causes for developmental deformities among wild populations. Morphing his long time biology portfolio with artistic expression, Ballengee introduces the exhibit “Ghosts of the Golf” at the Beacon Institute for Rivers and Estuaries. The exhibit will be open through March 8, 2015, and an artist talk and reception will be available on December 13 from 5 – 7pm. The event is free and open to the public, online registration is required. Beginning "Ghosts of the Gulf" after the 2010 Deep Water Horizons (DWH) disaster Ballengée morphed art and biology as an effort to generate public environmental awareness on the disaster. 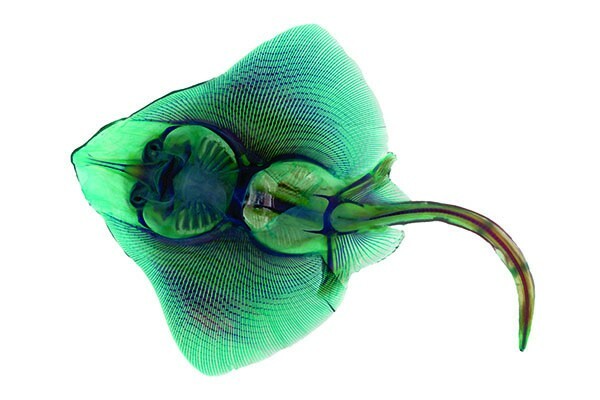 Through a series of chemical baths, Ballengée’s specimen-subjects transition into brightly colored x-rays revealing the complex architectural anatomy of these beautiful and vanishing species. The specimens showcased in the “Ghost of the Gulf” showcase vivid images of marine species in the Gulf of Mexico after the deadly oil spill, but do not display deformities as they were found shortly after the incident and the long term affects have yet to be determined. Since 1996, Ballengée’s investigation focus has been on the occurrence of developmental deformities and population declines among amphibians. Ballengée, whose scientific inquiry is electrified by the rapid decline of amphibian populations around the world, has received international media attention from the BBC for his scientific research publications and solo art exhibitions. The Beacon Institute’s gallery is located at 199 Main Street in Beacon, NY.